FLAX SEED, KENO AND BEARS, OH MY! I just came back from Las Vegas and I have to say my favorite spot was a place where nary a video slot, craps table or vodka-sponsored pool party could be found. 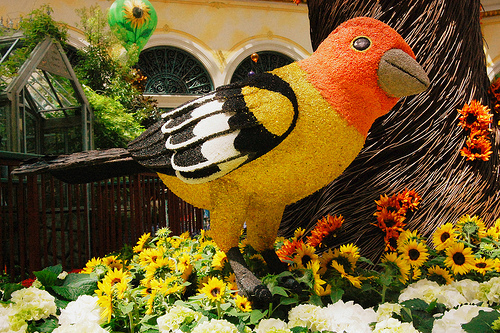 It is the botanical gardens at the Bellagio. If you have some time, are dead broke and looking for a refreshing scene, wander through the finely cultivated conservatory and admire the 2011 Summer Exhibit. 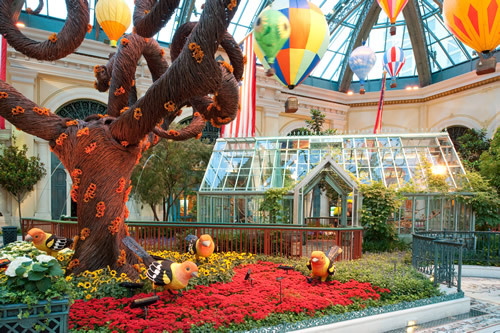 Amongst the flowers, fauna, working carrousel and koi pond is a majestic tree, 25 feet in height. It is made completely from 60,000 Willow witches, a native plant of England, which is harvested in the winter for basket weaving and roof thatching. From a distance it looks like a denuded tree. Up close it is even more impressive for you can see intricate detail of the intertwined witches. Three thousand hours went into weaving this spectacular organic structure, many of the hours donated by patrons looking to pay off debts incurred at the blackjack table. Beneath the wicker tree are four garden birds decorated with seeds and dried plants like lettuce, onion, poppy, flax, lentil, seaweed, magnolia, straw flower and coconut. The birds not only look colorful they also taste great, so much that a few of the birds have been caught pecking at their own wings. 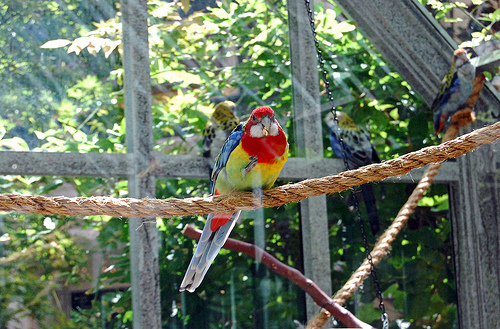 Speaking of birds there is a small glass house behind the wicker tree that holds live parrots and parakeets. One of the birds is a medium size parrot called the Rosella. It is native to Australia and loves to eat fruit and peck seeds from its stationary neighbors. It shows a playful nature by flopping around in a birdbath. It does not like to be gawked at by those wearing fanny packs and carrying camcorders. So, if you intend to take its picture, be sure to bring a bribe in the form of sunflower seeds or chips it can later use at the roulette table. 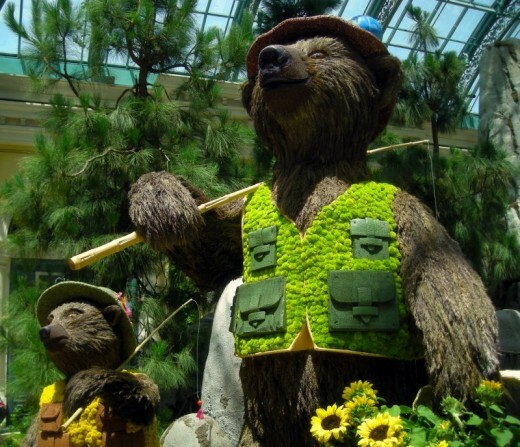 On the other side of the birdhouse are a father and son bear made fully of Pampas Grass and sporting colorful vests made of Kermit and yellow button mums. Like their distant cousin, Smokey the Bear, they are not big fans of forest fires. In fact, they cannot be within 100 feet of a roaring campfire. They would also appreciate it if you refrained from smoking. Other than a few simple rules that a five-year old boy will never follow, enjoy your time in a brief respite of nature surround by miles of desert and whimpering cries of dreams long gone.